Seeing Arctic Monkeys is like an experiment in trying to understand the classic nonchalance of the British. Is it a cool kind of aloofness, or are they knowingly being arses? came out and started with a slow song. The group's aesthetic is always a surprising thing, based on opposites. Front-man Alex Turner washed his hair but wore black leather, while lead guitarist Jamie Cook wore a mean plaid shirt that made him look like your average Vancouver hipster. Despite being a rock band, the show employed an alarming amount of strobe light, which added extra rigour to some of their more popular, catchy tunes like "I Bet You Look Good on the Dancefloor" and "Crying Lightning." They also played "Sketchead," a bonus track from their latest album Humbug, which Turner admitted in his charismatic Sheffield accent had only been played a couple of times before. 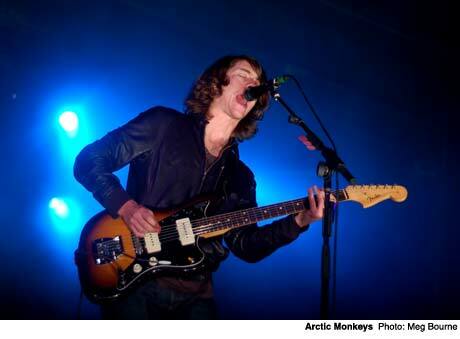 When it came to actual stage presence, Arctic Monkeys impressed upon the audience the stereotype of the stiff British upper lip. Despite the tunes being aggressive and raw, the energy was lacking as the quartet mostly moped around, occasionally tossing their hair around half-heartedly and lethargically like they didn't need any more friends. Or perhaps they were bored with the ones they already had.